This article explains alternatives available for accessing your @outlook.com, @hotmail.com, @live.com, or @msn.com account now that the Windows Live Mail 2012 email application has stopped connecting to these email accounts. Note: Windows Essentials 2012 suite reached end of support on January 10, 2017. It is no longer available for download. Email accounts ending in @outlook.com, @hotmail.com, @live.com, or @msn.com are powered by Outlook.com. Outlook.com has been upgraded to a new infrastructure that delivers innovative email and calendar experiences with enhanced performance, security, and reliability. Windows Live Mail 2012 will no longer synchronize email, contacts, and calendar events from these accounts because Windows Live Mail 2012 does not support the modern synchronization technologies used by the new Outlook.com. You will continue to have access to your existing email, contacts, and calendar data that is currently stored in Windows Live Mail 2012 on your personal computer. However, to access new email, new calendar events, and new contacts data from your Outlook.com account, you will need to switch to one of the alternatives mentioned below. Here are some alternatives you can use now that Windows Live Mail 2012 has stopped connecting to your Outlook.com account. Go to www.outlook.com using a web browser and enter your @outlook.com, @hotmail.com, @msn.com, or @live.com email address and password to sign in to manage your email, contacts, and calendar data. The built-in Mail app on Windows is the recommended replacement for Windows Live Mail 2012 and is the most-used email application among Outlook.com users today. It's designed to work with the new Outlook.com, offers a more modern and touch-friendly interface, and integrates elegantly with the Windows platform. The Mail app comes pre-installed in Windows 8.1 and Windows 10. Like Windows Live Mail 2012, the Mail app on Windows is free. Select the Mail tile to launch the app. Navigate to Setting > Accounts > Add an account. Choose the type of account you want to add, and then follow the on-screen instructions to enter your @outlook.com, @hotmail.com, @live.com or @msn.com email address and password and Sign in. Select > All apps > Mail to launch the app. Select > Manage Accounts, select your account, and select Change mailbox sync settings to set how far back in time you want to synchronize your Outlook.com data with the Mail app. 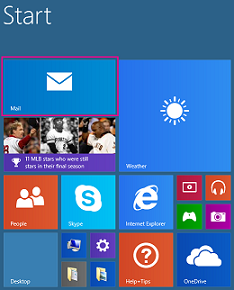 See Mail app on Windows 8.1 or Mail app on Windows 10 for additional instructions. With the above steps completed, your calendar events will synchronize with the Calendar app on Windows, and contact data will synchronize with the People app on Windows. If you're using Windows 7, you can upgrade to a newer version of Windows to enjoy the Mail app and other benefits, or you can use a web browser to access your email account. Office 365 subscriptions include the Outlook 2016 email application as well as other productivity applications such as Word, PowerPoint, and Excel. Outlook 2016 works on Windows 7, Windows 8/8.1, and Windows 10. To get started with Outlook 2016, see Add your Outlook.com account in Outlook 2016 for Windows. Note: This section applies only to users who have locally stored emails in Storage Folders or locally stored contacts in Windows Live Mail 2012 application. Windows Live Mail 2012 application allows you to move emails out of your Outlook.com account and store it offline in local storage folders. Similarly, contacts data can be locally stored offline. If you have used this feature to take data out of your Outlook.com account, we recommend that you move that data back into your Outlook.com account prior to the upgrade so that it can synchronize with any new email application you may want to use. The following steps describing how to move data will ensure that your data is accessible in the Outlook.com account via a web browser, and in your new email application when you connect it to your Outlook.com account. Create one or more folders in the list of folders that synchronize with your Outlook.com account. Your Outlook.com account may be of the form @outlook.com, @hotmail.com, @live.com or @msn.com. It may also be referred to as Windows Live or Microsoft account. Browse for and select the file created in the steps to Export locally stored contacts. If you choose to use the Outlook 2016 for Windows application, you can move data directly from Windows Live Mail into Outlook 2016. Refer to detailed instructions at Export Windows Live Mail emails, contacts, and calendar data to Outlook to learn how to move emails and contacts to Outlook 2016. We are upgrading Outlook.com to a new infrastructure, powered by Office 365, that helps you collaborate effortlessly with Office documents, get more done using partner add-ins, and focus on what matters. This new infrastructure uses modern synchronization protocols that provide enhanced performance, security, and reliability. Windows Live Mail 2012 uses an older synchronization protocol that is incompatible with this new infrastructure. Anyone who currently uses Windows Live Mail 2012 application to connect to an email account ending in @outlook.com, @hotmail.com, @live.com or @msn.com from Outlook.com needs to switch to an alternate email application or start accessing their email via web browser. People who use Windows Live Mail 2012 application to connect to email services other thanOutlook.com, including Gmail, Yahoo Mail, or others that use POP3 or IMAP protocols, do not need to take action. Outlook.com users who do not use Windows Live Mail 2012 application also do not need to take action. You may always continue to access Outlook.com from any web browser at www.outlook.com. Alternatively, you may use Outlook 2016 application, which works on Windows 7, 8/8.1, and 10. Office 365 subscriptions include the Outlook 2016 desktop app as well as other productivity applications such as Word, PowerPoint, Excel, and OneNote.